Presenting Richard Wentworth (Samoa 1947 – lives and works in London) is a great honour for pinksummer, but at the same time it is a somehow difficult task, even with a short writing for press release: the risk is to copy ideas already expressed and expressed again, falling into the obvious. From the late 70s Richard Wentworth, together with Richard Deacon and Tony Cragg, played a key role in the subversion of the traditional concept of sculpture. The so called “New English Sculpture”, born under the sign of Marcel Duchamp, has included the “raw” industrial object, putting it into new contexts, new needs, new relationships, and giving to the viewer a fresh look at the world. A book comes to mind published just in 1974, when Wentworth began to shoot the series of photographs “Making Do and Getting By”, found sculptures in everyday life that present a magic urban realism: the book is “Zen and the art of repairing motorbike” by Robert M. Pirsig. The author talks about the hate of technology of his two friend Sylvia and John, a sentiment shared by many who feel how technology and industry are engaged with the political forces trying to transform people into mass. Pirsig affirms that he doesn’t agree with his two friends, because escaping technology ineluctably brings to the defeat. Buddha or the Divine are in the motorcycle machine as in the petals of a flower: “When John looks at the motorcycle, he only looks at the steel components that inspire him negative feelings, and so he turns off. I am looking at the same steel components and I see ideas. John thinks that I am working on machine components, while I am working on concepts”. Through his work, a sort of philosophy of life, Wentworth reveals the connection between industry an military “barely visible but infinitely affecting” which is central to the idea of globalism: his force as sculptor, photographer, curator tends always to light and enrich the perception, giving to the viewer an instrument of resistance towards mass production and globalisation. In a system where not even the Lego construction kit for kids are free from the instruction booklet, thinking the object in an anarchic way, as opposed to being informed about it, is a breath of fresh air, helps not to feel strangers at home, as the boys who select the electronic sound of Game Boy to invent their own chip music, subverting the use of the object. It is a political message, so subversive as it is peaceful, which invites to think: sometimes they are small alterations that, by disorienting, teach how to orient oneself and slowly to reappropriate of reality: which has to belong to us if we want to be persons, individuals in the less egoistic meaning of the word. 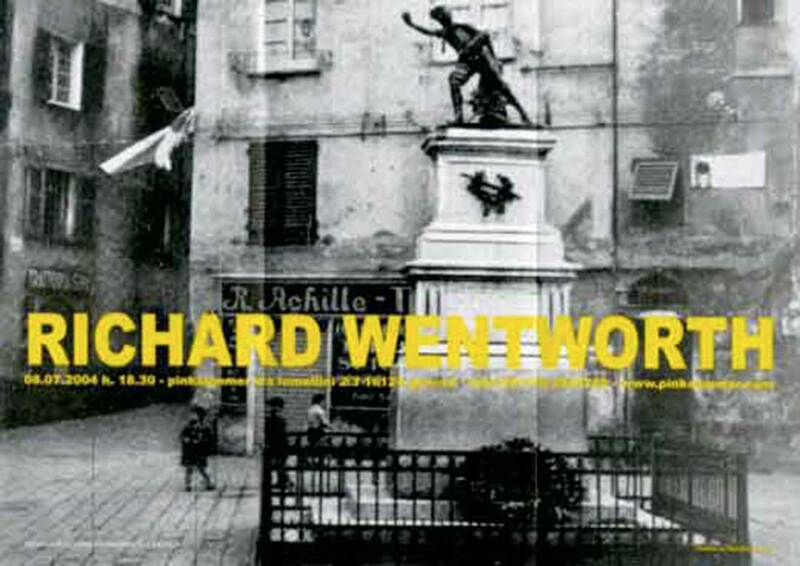 For the invitation of his pinksummer solo show, Richard Wentwoth asked us to choose a old postcard of Genoa. We found a place, Portoria, which is no longer the way it was. At the centre there was the monument of Balilla, dear to old Genoeses. Balilla was a boy who, distressed by the arrogance of Austrian occupying soldiers invited the population to throw stones against them to induce retreat: thus the people free their city; the images seems conceptually akin to Wentworth’s work. In this respect, besides his assisted ready-mades and the photography searching for the spontaneous destruction of commonplaces, we have to name the project commissioned by Artangel in 2002: “An Area of Outstanding Unnatural Beauty” an investigation in the psycho-geography of London starting from King’s Cross, where Richard Wentworth has been living for 25 years. It is a very articulate project, though, and we invite you to look at the website of Artangel. We would also like to mention “Thinking Aloud” ,a show curated by Richard Wentworth in 1999, which, as someone noted, even if not exhibiting any of his works could be looked as an extended work by him. A sort of wunderkammer in which the artist tried to explore the process of formalization of ideas: “how thoughts become ideas become realities”. Among the several objects shown there were the first drawing of Pluto by Disney, the maquette of Guggenheim Bilbao by Frank Gehry and works of a number of young artists, including “Garbage Bag” by Ceal Floyer. Many of the YBA’s consider Richard Wentworth a father, who, as Stanley Cavell wrote in “The Claim of Reason”, has taught that “The ways of initiation are infinite, it doesn’t finish to find new potentiality in the words and new ways to discover objects” turning the ambiguity of reality into a creative stimulus. At pinksummer the artist will show a group of 60 photos from the series “Making Do and Getting By”. We would like to thank Neal Robert Wenman, curator at Lisson Gallery, for his precious help.